July 26, 2011  Four months after NATO airstrikes began, an unyielding Moammar Gadhafi is still facing off against the opposition. The Obama administration is looking for ways to tip the scales. One U.S. official is pushing for using clandestine action to target Gadhafi. July 18, 2011  A year after President Obama asked Gen. David Petraeus to jump-start the counterinsurgency operation in Afghanistan, he's handing over command. And there's a question of whether the change also signals a shift in strategy — from fixing Afghanistan to taking out insurgents with targeted raids and drone strikes. July 15, 2011  Defense Secretary Leon Panetta is just back from trips to Afghanistan and Iraq. 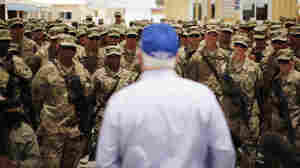 They are his first visits to the war zones since taking over the top job at the Pentagon. His trip was punctuated with rough and tumble rhetoric. July 11, 2011  During a visit to Baghdad, Secretary of Defense Leon Panetta urged the Iraqis to make a decision about whether they want U.S. troops to stay beyond the end of this year. He also said the U.S. is concerned "about Iran and weapons they're providing to extremists here in Iraq." 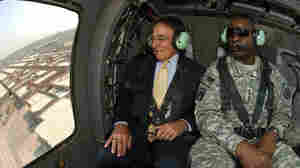 July 11, 2011  Defense Secretary Leon Panetta flew to Afghanistan and Iraq over the weekend. The unannounced visits were his first to those war-zones in his new role. Before moving to the Pentagon, he was head of the CIA. July 9, 2011  Secretary of Defense Leon Panetta arrived in Afghanistan on Saturday for his first visit to that country since assuming the position. Panetta's view of the war there may be colored by his experience as director of the CIA and the successful raid that killed Osama bin Laden. June 27, 2011  Robert Gates has served under two administrations — the first to do so for different parties. He's known for speaking his mind when asked direct questions, and for letting troops know how their deployment weighs on him. June 26, 2011  River levels have just peaked in the city of Minot, N.D. Levels are now more than 6 feet above major flood stage. As many as 4,000 homes are flooded and more than 10,000 people remain evacuated from the city's center. June 12, 2011  Game 6 of the NBA Finals is about to tip off. Miami Heat's LeBron James and Dallas Maverick Dirk Nowitzki have achieved a drama of mythical proportions. May 29, 2011  President Obama visited the devastated area around Joplin, Mo., for the first time on Sunday. He said the nation will be with the devastated city "every step of the way." 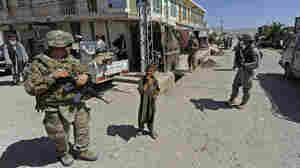 Will Bin Laden's Death Affect Afghan Insurgency? May 12, 2011  The Obama administration plans to pull some troops out of Afghanistan in July. But administration officials say the overall strategy will remain as is — in part because it's still unclear what effect bin Laden's death is going to have on the insurgency. May 8, 2011  On Saturday, the Pentagon released several videos seized by U.S. forces from Osama bin Laden's raided Pakistani compound. NPR's Rachel Martin reports on their significance. May 7, 2011  The Pentagon released five short videos on Saturday that were recovered from the Pakistani compound where Osama bin Laden had been living — and was killed. NPR's Rachel Martin tells host Guy Raz that the videos and other correspondence found at the compound in Abbottabad indicate that bin Laden was still a tactical leader for al-Qaida. May 7, 2011  Even before the Sept. 11 terrorist attacks, the CIA has had a special unit dedicated to tracking down Osama bin Laden. Now that the al-Qaida leader is dead, the missteps and milestones along the way are becoming chapters of a story that finally has an ending. May 5, 2011  President Obama has decided not to release the photos of Osama bin Laden taken after he was shot dead in Pakistan by U.S. forces. In an interview with CBS's 60 Minutes, Obama said bin Laden got the justice he deserved and there was no need to publish photographs to prove it.